I made Sweet sixteen invitaions for my niece. She was having a 50s themed party and I came up with the idea of making an LP invitaion. 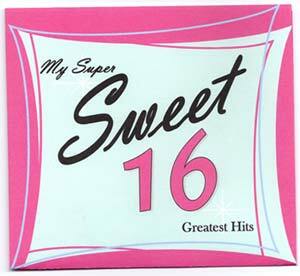 One the Album Cover it said My Super, Sweet 16, Greatest Hits. One the back it said In Honor of Paige and listed 16 "age related" songs. Inside was a CD of those songs and I made a CD label that said "Paige's Sweet Sixteen You Are Invited! Regrets Only and the phone number. On the sides of the label I had the party details Date, time, address and theme. At the bottom I listed the songs again that were on the cd. So it was a gift and invitation together... Turned out SO CUTE and very unique!